I've fallen seriously in love with the dahlia. Sadly I don't have any growing in my own garden, but I'm beginning to feel very envious of all the other folk who do. The other day, down at Forde Abbey in Dorset, I was very taken with all the colour and cheer that they brought to the perennial borders in the drizzle of a grey afternoon. It was a dreary day that had little to recommend it (other than the splendid company of the good friends with whom we were passing the time) but through all that dismal weather the dahlia stole the show and shone its colour through the gloom. We wandered around in the rain admiring them and wondering where they originally came from. Not knowing any better we guessed China, which was wrong. 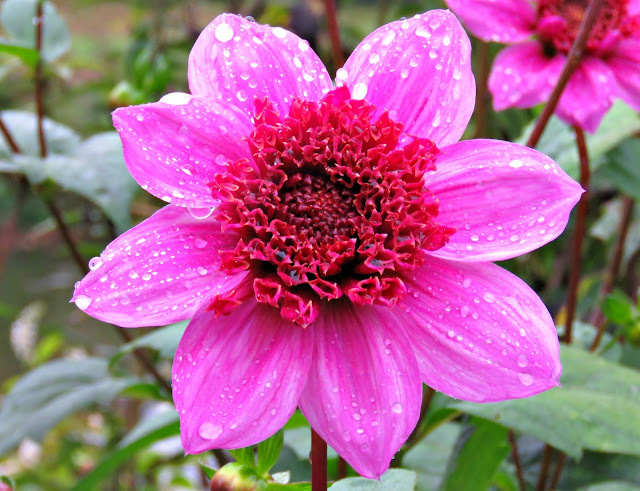 Quack, quack, oops.The dahlia is native to Central America, and is perhaps most closely associated with Mexico, where it was adopted as the national plant in 1963. It was once grown as a food crop by the Aztecs who used to eat the tubers. They also used them to treat epilepsy and made water pipes out of their hollow stems. The Spanish arrived, built their empire in the Americas and set about finding new and useful things to take back across the oceans as travel trophies. They tried to import the dahlia into Europe, along with potatoes and chocolate, as a food crop. Whilst the Old World was very willing to embrace the potato and fell hook, line and sinker for the heavenly nectar that goes by the name of chocolate, it never quite took to eating dahlias. Instead, somewhere further down the line, someone noticed how wonderful their flowers looked and elected to put them in vases rather than on dinner plates. And talking of dinner plates some of the giant flowering dahlia cultivars have blooms that exceed 25 cm in diameter, the size of a respectable dinner plate. Personally I prefer the less fleshy pompom varieties with dainty flowers that wouldn't look too ridiculous in someone's buttonhole. 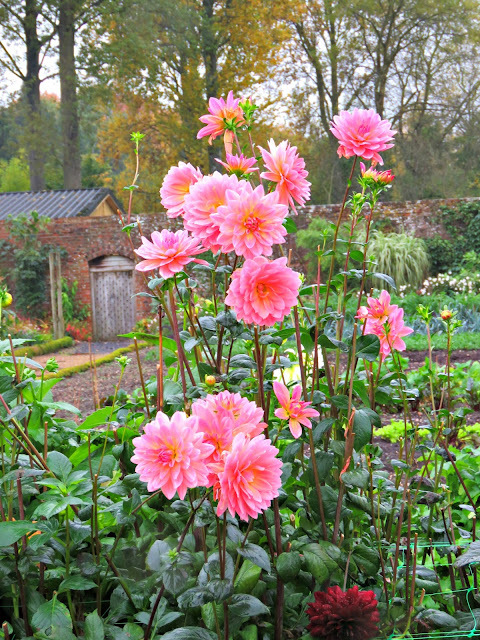 I also liked how the gardeners at Forde Abbey had planted drills of dahlias in the vegetable garden. They probably regard a few drills for cutting and flower arranging as a crop, along with the turnips and carrots and kale, albeit that it's a crop aimed at delighting the eye rather than the stomach. Some drills of flowers are no doubt useful when it comes to getting the bees to pollinate the other crops, and they're certainly good for morale with their joyful flourishes of colour. 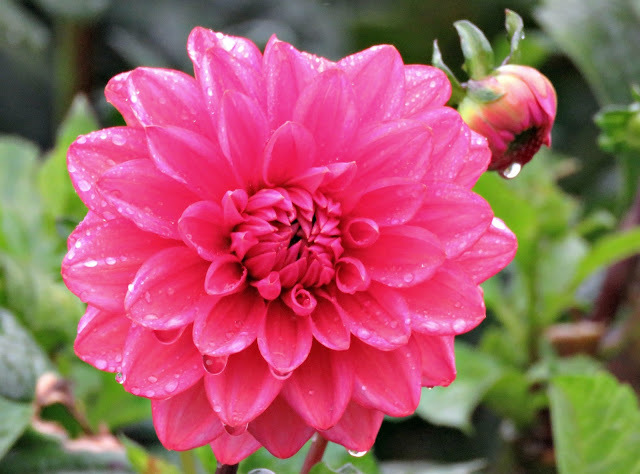 I couldn't imagine eating a dahlia. Who knows, maybe they taste better than chocolate. 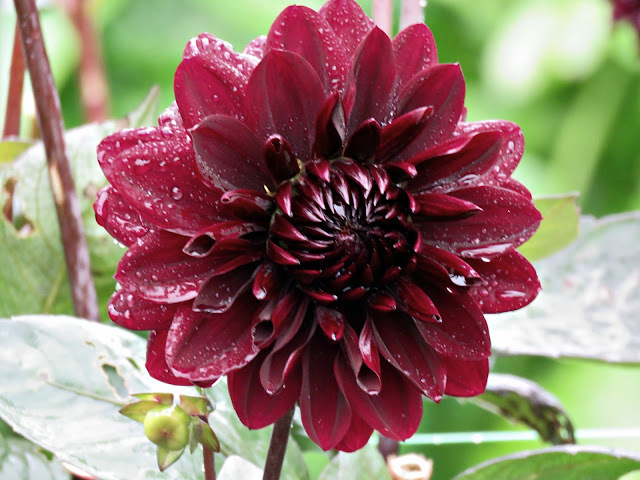 :) I have never seen a dinner plate sized dahlia, I have heard of them but never seen one. I bet they are beautiful. Have a great weekend! 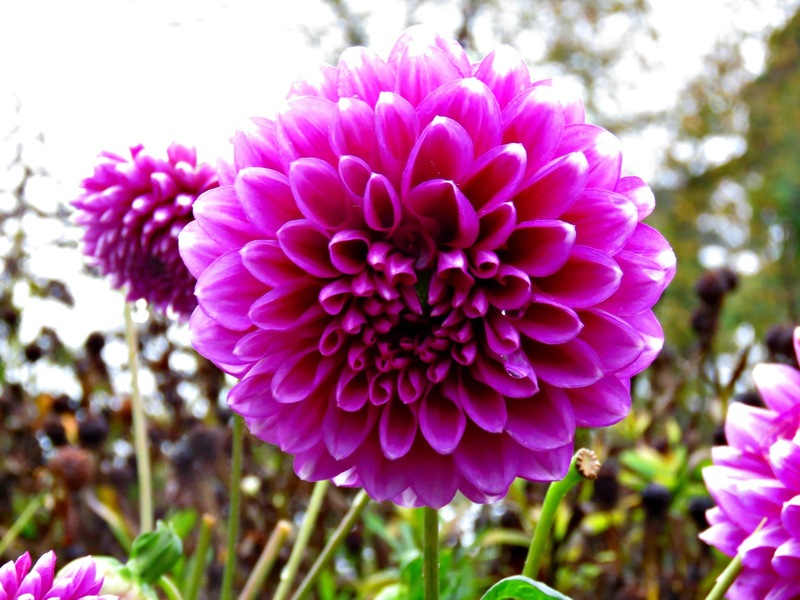 Those Dahlias are really pretty, the colors are so vibrant.